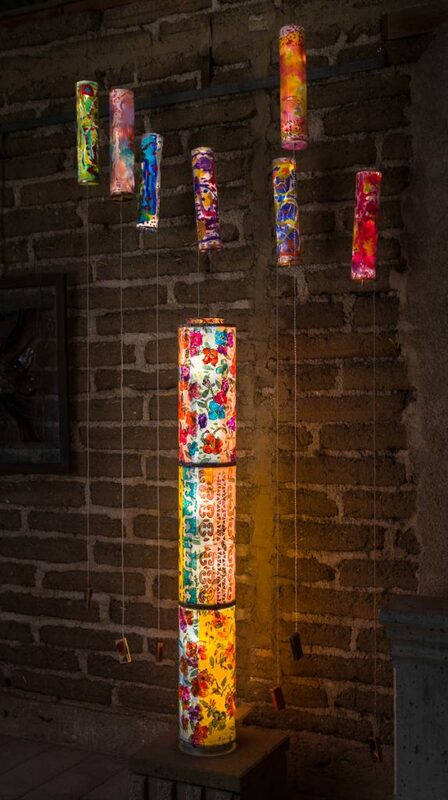 Project Description: Illuminate your artwork by creating a multi-layered glowing Dura-Lar Lamp that was featured at the Arizona Glow event. 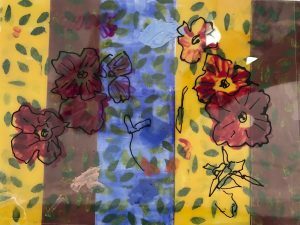 Start by painting with a brush or a roller on the three separate sheets of Wet Media Dura-Lar Film different transparent colors. Once dry, cut the sheets into strips. Glue them down to one side of a blank sheet of Wet Media Dura-Lar Film. Cut a stencil pattern like the little leaf pattern illustrated on the right. Stencil on the flip side of the color strips. Note: You can stencil one color or try several different colors. 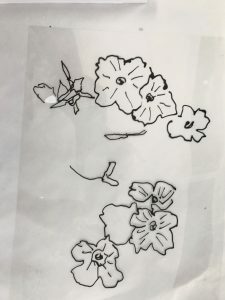 On a new piece of film draw some flowers using Golden High Flow paint in a Fineline Applicator. 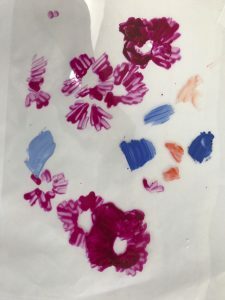 Lay a blank sheet of film over the flowers (after it has dried) and with the transparent colors paint inside the lines of the shapes beneath it. Stack the sheets together with the painted side up. Notice that you will need to cut the film to fit the grooves of each cylinder section of the lamp. Before you cut the film, roll it into a cylinder to match the size of the lamp rings. Measure your specific lamp’s groove sizes to cut the film to match. Note: This may take some trial and error. After you have marked film, lay the stack flat. Then use the ice pick to poke holes about an inch from one another going around the top, middle and bottom sections of the film. Stich the film together using the wire to hold the film in place. Now cut the film to match the grooves and use the clamps on the lamp rings to secure the film. Depending on the size of your cylinder you may need assistance with this next part, place the cylinder on top of the lamp. 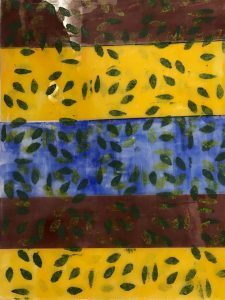 Using one sheet of Dura-Lar, paint the same stripe, leaf and flower designs as you did for the larger lamp. After the film has dried roll the sheet up, take the plastic tube lid off and place inside. Add the string of lights inside the center of the plastic tube. Note: you might need to use a thin dowel stick or something similar to evenly space the lights.